We thought we were doing continuous delivery i.e. every commit can go to production, but it was broken this time. We needed to find out how to handle long running rewriting in a "continuous delivery" manner. We came across a similar situation in the recent past. This was for an application which allowed the user to create custom designs, which they can print in their T-Shirts or hoodies. We were using RGhost for creating the designs in PDF but later realised that because of certain constraints with RGhost it’s better to use LaTex. And we change one function by function to the new implementation. We added feature toggle too so that we can switch to old implementation in case we find a problem in production. The approach was really great, because we could fine tune the new implementation with the learnings from production and as it was in small batches and it was completely fine to complete the port in few weeks time as there was no dependency on this. The above technique is similar to the technique called Branch by Abstraction, i.e. 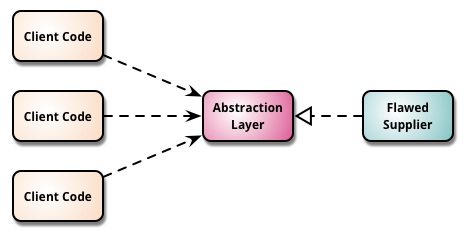 introduce an abstraction layer and route it to the existing implementation. 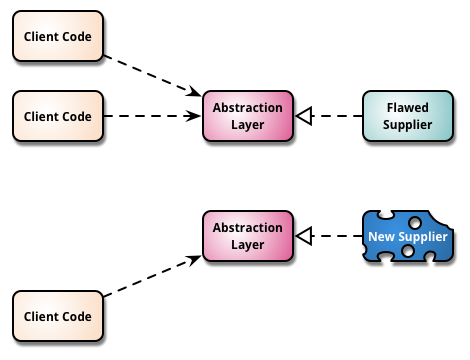 Let the abstraction layer redirect to newer implementation as an when it is ready. Mechanics must be able to simultaneously work on the upholstery, engine, etc. The car must be drivable after every change. Mainline Development and Feature toggles help you to achieve this mantra to a great extend, but the question is how do you handle major refactorings or rewritings? Use Branch by Abstraction. Yes, it requires the discipline to use abstractions appropriately. But why not, if the same helps for better maintenance.